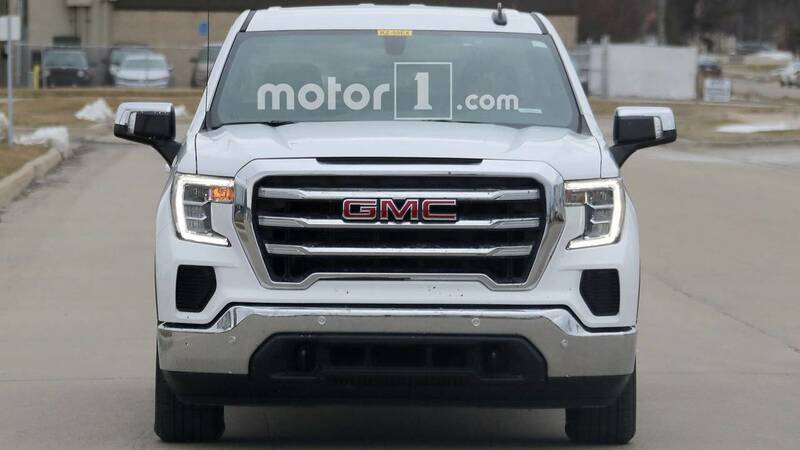 Additional variants of the latest GMC Sierra 1500 have been showing up on the road. The latest one is the SLE variant, and this one shows off the Double Cab body for the first time. The only camouflage on this truck is a small section on the front fender that conceals the powertrain badge, so this is a fantastic opportunity to check out this more basic trim of the pickup. For example, the grille is less ornate on this model than on the Denali or AT4 versions. This test mule has a simple chrome rear bumper, and there's single exhaust back there. The wheels on this one look much smaller than the 22-inch pieces on the Denali and SLT. The Double Cab body on this test mule equips the pickup with four doors, but the ones in the rear are shorter than on the larger Crew Cab variant. For people who seldom carry occupants in the back, the Double Cab layout gets them a truck that generally costs less than with the Crew Cab. We could see even more Sierra variants under development before the pickup officially goes on sale this fall. So far, GMC confirms the availability of the range-topping Denali, SLT, and off-road-ready AT4 versions. 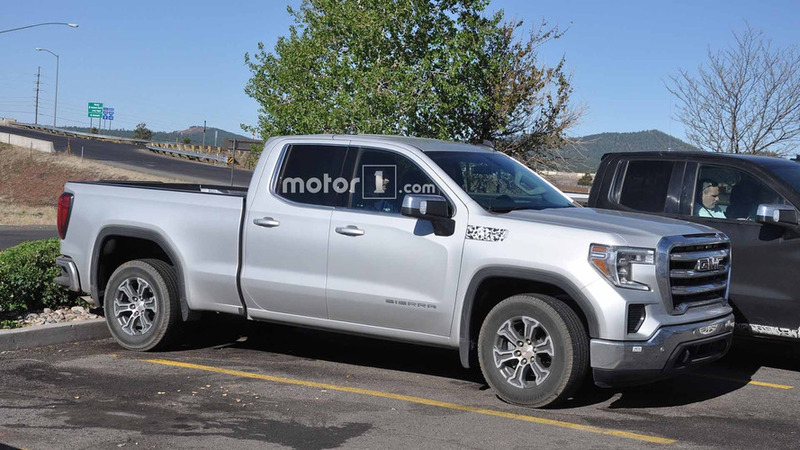 Spy shots also show the existence of the SLE Crew Cab (gallery above) and Elevation Edition. At launch, the Sierra 1500 will be available with at least two engines. A 5.3-liter V8 produces 355 horsepower (265 kilowatts) and 383 pound-feet (519 Newton-meters) of torque, and a 6.2-liter V8 has 420 hp (313 kW) and 460 lb-ft (624 Nm). A 3.0-liter inline-six turbodiesel becomes an option later, and there's the possibility that the Chevrolet Silverado's newly revealed 2.7-liter turbocharged four-cylinder with 310 hp (231 kW) and 348 lb-ft (472 Nm) might be available.